While other retailers clamor for your cash by throwing their doors open Thanksgiving night, Apple’s Black Friday special appeals to your philanthropic side. As part of a 2-week-long effort to raise money for (RED), the nonprofit organization U2 singer Bono founded to fight HIV/AIDS in Africa, Apple will be giving away (RED)-branded iTunes gift cards with the purchase of certain Apple products this Friday. Proceeds from every Apple product sold on World AIDS Day, which coincides with Cyber Monday on Dec. 1, will go toward (RED). 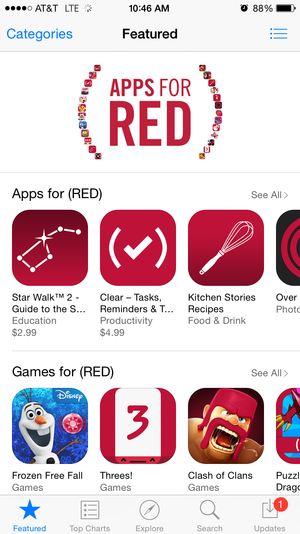 Apple also encouraged app developers to create in-app purchases that will be donated to (RED) starting today. When you play Zynga’s CSR Racing game, you’ll be able to buy a special (RED) Mercedes-Benz, USA Today noted. Apple will donate those in-app purchases and proceeds from participating paid apps to (RED) until Dec. 7. Threes!, Clash of Titans, FIFA 15, Monument Valley, and Kim Kardashian: Hollywood are among the games participating in the (RED) campaign. Kardashian’s game, which is expected to rack up $200 million from in-app purchases by the end of the year, is selling Beats-branded red headphones, clothing, and other virtual items that will benefit (RED). Clear, Over, and GarageBand are a few of the non-gaming apps you can buy to donate to the nonprofit. Find participating (RED) apps in the featured App Store section. Apple has worked with (RED) and the Global Fund since the nonprofit launched in 2006 and has contributed more than $75 million in sales of (RED)-affiliated products like the red iPod and various iPhone and iPad accessories. Why this matters: Apple traditionally offers Black Friday deals, though not the deep discounts other retailers need to get people in the door. With new iPhone models still flying off shelves faster than Apple can stock them, it’s unclear if the company will offer any other holiday specials. But if you’re opposed to Black Friday mania and want to feel better about being a consumer this holiday season, a side of philanthropy with your shopping is a nice touch.